So Ann Coulter spoke at the University of Calgary last night, and Canada is still intact. There is no way to know whether Coulter’s remarks at the University of Ottawa – which she did not deliver because she was, in effect, driven away by a crowd of protesters – would have differed from the remarks she gave at Calgary, where she was treated almost politely. The episode at Ottawa was interesting in its own way because the protesters presumably were to the left of Coulter on the political spectrum but were behaving a lot like people in the States have behaved recently — people who, one would assume, are in Coulter’s vicinity on the philosophical scale. So folks of all stripes are capable of intolerance. This incident and others like it also expose the fact that many of us are almost infantile in our understanding of the very institutions we pretend to uphold. In particular, people like those who hounded Coulter at Ottawa don’t grasp, or don’t want to accept, the radical principle that by whatever criterion we mitigate the rights of one person, we put our own rights in jeopardy. Such people also don’t grasp that they have to be willing to be offended if they want to live in a free society. It’s what the ancients called “a hard saying,” and far more of us subscribe to it rhetorically than like it when it’s put into practice. “If we don’t believe in freedom of expression for people we despise, we don’t believe in it at all,” as Noam Chomsky put it. There’s a guy who occasionally sets up shop outside the post office down the street to spread his vitriol about Barack Obama — which I don’t agree with, and Nancy Pelosi — which is negotiable. I hear neighbors complaining about that guy, but to me he is just a part of the big portrait of America. I don’t like Ann Coulter, but I feel much more secure in my own life to the extent that she is allowed to say what’s on her mind. Old enough to remember “liberal arts colleges” and liberals who seemed to actually like people, I’m occasionally astounded by the level of vitriol on the left. The right has its problems too, of course, but increasingly it seems possible we’ll see this country pull itself apart at the seams. Your use of the word infantile seems appropriate. Much of what I’ve witnessed over the past weeks has been the equivalent of mental toddlers hitting one another over the head with word-clubs. comment that by whatever criterion we mitigate the rights of one person, we put our own rights in jeopardy. I think the left (count me in!) has added its quota of language. But not threats and rock-throwing. 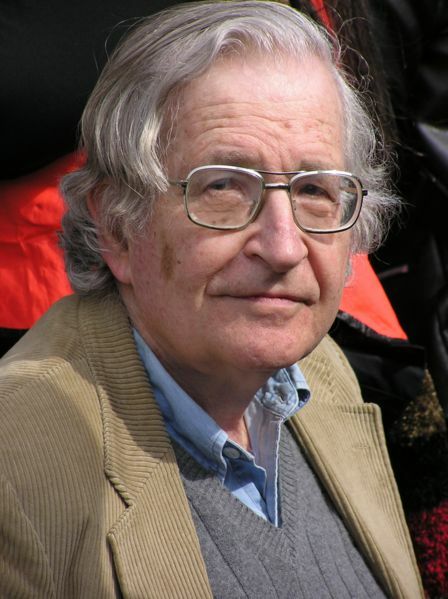 Where the kind of free speech we celebrate ends — the kind that Chomsky defends — is where threats are shouted or implied as part of that speech. The guy down by the post office may be a nuisance, but it doesn’t sound as though he’s threatening people. The left has kept its head with few exceptions, and the right most notably has not. There is no equivalence there. I wholly agree about the treatment of Coulter. Let her speak! We learn from Coulter about the banality of evil and that’s a lesson a lot of us need to learn.